In the fall of 2013, a dedicated group from Greece, the Netherlands and the U.S.A. formed a consortium - SAIL MED - to promote clean, renewable-energy transport (by sail) in the Mediterranean Sea region. With the EU-funded North Sea consortium "SAIL" now completing its mission to design a 150-meter Ecoliner, SAIL MED aims to further promote hybrid-sail cargo vessels for southern Europe. At the same time, cargo-carrying schooners and other sailing vessels will be part of the wind-energy transformation in the Mediterranean, as SAIL MED's mission includes developing sail cargo with existing and traditional vessels. 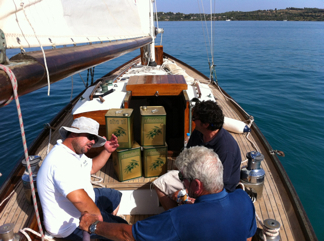 This has already begun, with the first of small shipments of olive oil sailed (with no engine) from the Peloponnese to the island of Spetses that started this summer. More projects are being planned. SAIL MED is also recruiting partners for a European Union grant-project focused on sail cargo via hybrid sailing ships and organizing local producers for economic development, distribution networks, and buyers. In September 2013, sailor and former oil industry analyst Jan Lundberg paid a call to Chios, a large island near Turkey. Chios has a rich sailing past, and boasts two historical personages as residents: Homer and Christopher Columbus. Southern Chios is the only place in the world where mastic trees grow and supply that ancient substance, mastic, for a number of valued products. It was when Jan visited a harbor in the north part of the island that for centuries had ships sailing cargo to and from the Black Sea, he said "It will come back. The time is now." 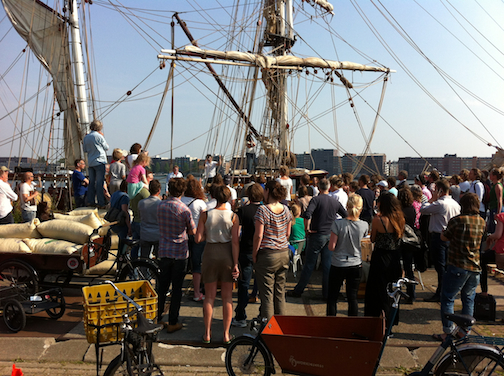 Upon discussions with Robbert van Hasselt of the SAIL consortium as well as with interested Greeks, SAIL MED was born. Sail Transport Network, ID Management, Fair Transport (operator of the Tres Hombres tall ship), and the Development Center of Oinousses are initial Partners in SAIL MED. With additional invited Partners, and SAIL MED's growing network for sail cargo transport in the Aegean and Mediterranean Seas, the group will seek state and private funding. "We see interest on the rise. We're drawing upon the long, proud history of the region's sail power for creating a sustainable economic model that involves the absolute minimal pollution of our seas. And it means a boost for tourism and shipping-related employment," said Jan Lundberg. 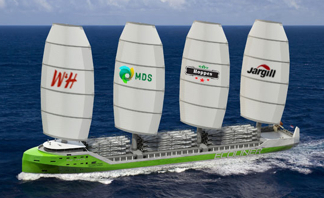 The July 28, 2014 Wall Street Journal report on sail power's potential for cargo shipping is evidence of the inevitable trend toward clean wind-power to save on fuel costs. The average speed of large cargo ships since 2008 is 15 knots, no faster than many clipper ships over a century ago. The state of the global climate and pollution of the air and water is increasingly tied to conventional cargo ships. Just 16 of the largest emit as much sulfur and other pollutants as all the world's cars. Finally, the next geopolitical oil crisis may leave oil-powered ships helpless. In the longer term, oil supply for the global corporate economy will only become more strained, because the world peak of conventional oil extraction was in 2005, and substitutes are not so attractive or cheap. Future local economies fostering resilience will be relying on sail power to exchange surpluses to enhance food security. In addition to goods, passenger travel by sail is already needed and will no doubt expand. The future can be lived now, even if it is just for enjoying the peaceful thrill of sailing on the sea. SAIL MED looks forward to an expanding network of sailors, vessels, producers and buyers.